Wow! Google offers Free Website with .in domains - Grab Now! Wow! Google offers Free Website with .in domains – Grab Now! Google is really taking Indian Market very seriously – According to an announcement today by Google has launched –India Get Your Business Online – initiative that will offer Indian Small & Medium sized Businesses completely free website along with a .in domain name. Additionally, this initiative offers businesses free Email Addresses backed with 365 day support. Essentially, everything that you will need to get your business online. Given the potential of growth in India – Google has played a master-stroke here by making it absolutely easy for Indian Businesses to come online. Just head over to India Get your Business Online website, choose your domain name, fill up a form giving some of the details and you are done. What all things do you get? Free: It’s free to set up your website. The domain is free for 1 year, and it’s free to maintain your website for 12 months. 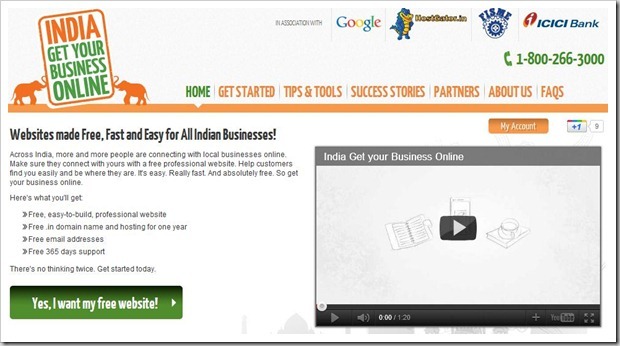 If you want to make your website work harder, you’ll have access to steady stream of free tips and tools from the Getting Indian Business Online team and a free coupon of worth Rs. 2500 INR advertising trial from Google AdWords to help promote your site. After the first year, SMBs can choose to pay a monthly pay-as-you-go to maintain their website using hostgator. At the end of the first year, they’ll have to pay a nominal charge if they wish to renew their domain name. They can cancel their website at any time. India get your business online program is also supported by Federation of Micro, Small and Medium Enterprises (MSMEs), popularly known as FISME. FISME, the non-profit organization will work with Google India to help SMBs get online through direct customer outreach and events. All in all, this is a great initiative by Google! What is your take? India ‘most improved’ in Bribery index 2011 ! Google puts 2500 businesses from Chandni Chowk online…free! Top 5 Free Website Builders for Small Business Owners & Entrepreneurs! You may undoubtedly visit understanding the repair you’re writing. The arena hopes for a lot more excited copy writers as you whom aren’t reluctant to mention that they believe that. Constantly pursue your current heart vps. Great work by google but i have not pan card so how i can register??? yet this time I don’t hope that one can provide free website with.in domain. I have given my ID. If it will be true, thanks a lot. I have got thier website. Can u guide how to cancel it..want to buy tht domain now and change the NS. Google is not exactly promoting free web for all! Now they earn more from the power of FREE than any other promotional strategy! As an online Marketer & web designer i can surely bet on that.Now Google & hostgator is providing free website for small & medium businesses in India for the period of one year. They are investing for future by this as the next year they can persuade those business owners to pay for the costly hosting & Domain charges. Now this is an unfair marketing strategy they have adopted. Now the hosting & Domain charges for the second year is sky high. And the business owners are surely going to be deterred from renewing their website domain & hosting as they are not likely to get results from an unprofessional website design which is not optimized for search engines. Now having a website online is one thing but having the customers find it is more important! And the program partners may use the contact details of these business owners to promote their products and services. Google knows that free is more powerful than discounts and cost efficiency factors in front of innocent customers. So they stick them with huge bills behind the back with the power of FREE!! I have to make totally free website with its domain name . is it possible for our organization. a lot of people approach us saying that they took a domain from Google and are not able to proceed with creating their website. Or they have got a very basic website they would like to change. Also according to them they are not able to shift the hosting somewhere else and thus stuck with this. Any ideas regarding this ?? I am sure Google would not do a scam by hooking poor SMEs to some domain name and providing the feature to move hosting or upgrade their website. One cannot customize the website as per their needs. The main constraint is thet they have to stick to the functionality and appearance provided by google. yet this time I don't hope that one can provide free website with.in domain. I have given my ID. If it will be true, thanks a lot. I just created a website using free domain(http://offpageservices.in) but there is no use because this free domain have restriction that no indexed means no ranking in search engines. this is totaly time wastage. Thanks For sharing this wonderful news…. What google is providing in the name of get india online is nothing but garbage, they are providing nothing new free, google apps, analytics, webmaster tools are already free since beginning. Google adwords coupon you can easily get free anywhere, adwords coupon is nothing but a tool to attract new adwords customer, almost every online business provide coupon for there services. There are thousands of free hosting provider already in market, providing first year free hosting also a bait to get new customer. Moreover the hosting is too limited with very less feature, no mysql database, no FTP tools, no cron job, no backup facility, no eCommerce facility. no blog facility, no ssl support. Many free hosting comes with more feature than what they are providing. Only worthwhile thing they are providing is a .in domain worth Rs 85/- , so they are helping Indian businesses with Rs 85/- per business after taking their PAN number. Never Never buy or associate anything with your domain name registration. Domain names are the face ur business. Keep it separate, do not contract or associate it any offers. not working for every name it is saying " not available". please visit my website http://www.brtricks.com. Thanks For sharing this wonderfull news…. <a href="http://www.jobvacanciesbd.com"&gt; jobvacanciesbd.com provides the job information like: Government jobs/ Govt. Job, Newspaper jobs, bank job, supply chain jobs. <a href="http://www.alljobsbd.com">Newspaper Jobs, Government Jobs</a>. <a href="http://www.jobsearchbd.com">Newspaper Jobs, Government Jobs</a>. Well nothing in this world is free so 1year the service is free but then you have to pay. But a good initiative by Google. Indian Small and Mid Size market is the biggest market in the whole world. So Google knows what they are doing. “NOT AVAILABLE”, doesn’t matter whatever domain you type. Is this FAKE? no use! "Not Available" Even for dsjkbsjbs.in. Its is good service for users who want to check if him/her business goes success online or not?If they happy with results then they can upgrade their plan.And if you not like hosting in hostgator then you able to switch your hosting company after one year. Haha, I’ve worked with enough Indian clients. I know the kind of cheap f**ks they all are. This is why even Google doesn’t dare to commit for more than 1 year to this project. Indians are adept at taking all that comes free, while ignoring the business’s original message that was intended to be passed on in exchange for the freebie. Not at all like people from the west. Anyhow, all I’m saying is that Google (or the stupid F**ks that bent over and coughed up the money for this) will end up losing all the invested cash – whilst only seeing normal growth patterns in the ad revenue. I guess there is some kind of error with the registration service. No matter what domain name I choose, it says not available, though WHOIS shows no record of such domains. I am also getting the same error while creating the website. I have tried several names but the result was same.